Instant Nylon Khaman or Gujarati Rasawala Khaman is a very famous snack or breakfast or farsan in Gujarat. It is a mix of sweet, spicy and tangy flavours and is very filling dish. It gets its name from the fact that water is used in its tempering to soften the Khaman and thus the name "Nylon" or "Rasawala" (Rassawala). They are very soft and spongy. This popular farsan is sold at almost all farsan joints in Gujarat. Preparing this Khaman is very easy and quick and there is no need for fermenting the batter. This is a instant recipe. 1. In a bowl mix Besan, Powdered Sugar, 1/4 Tsp Citric Acid and Salt. 2. 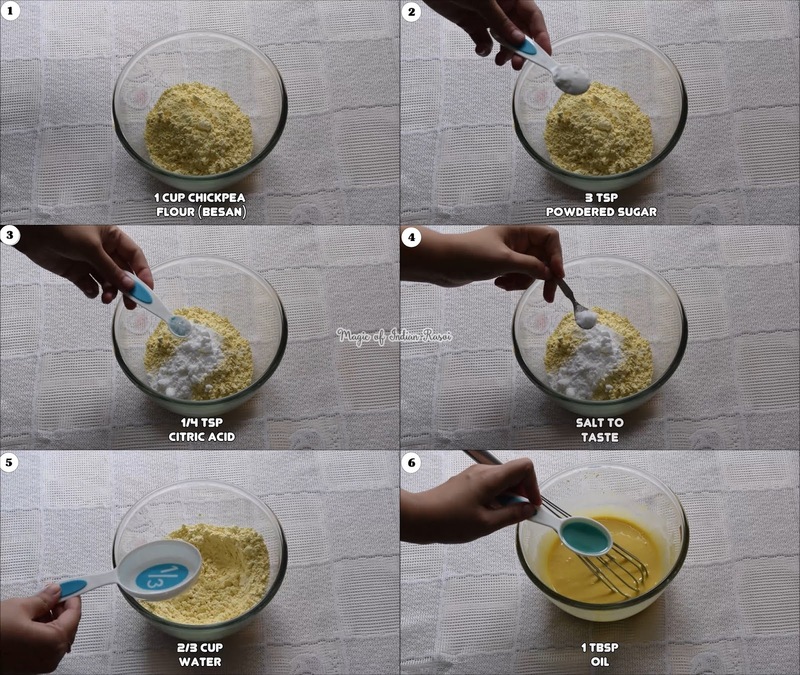 Gradually add 1/3 Cup + 1/3 Cup Water and make a smooth batter. Ensure there are no lumps. 3. Add 1 Tbsp Oil and mix well. 5. 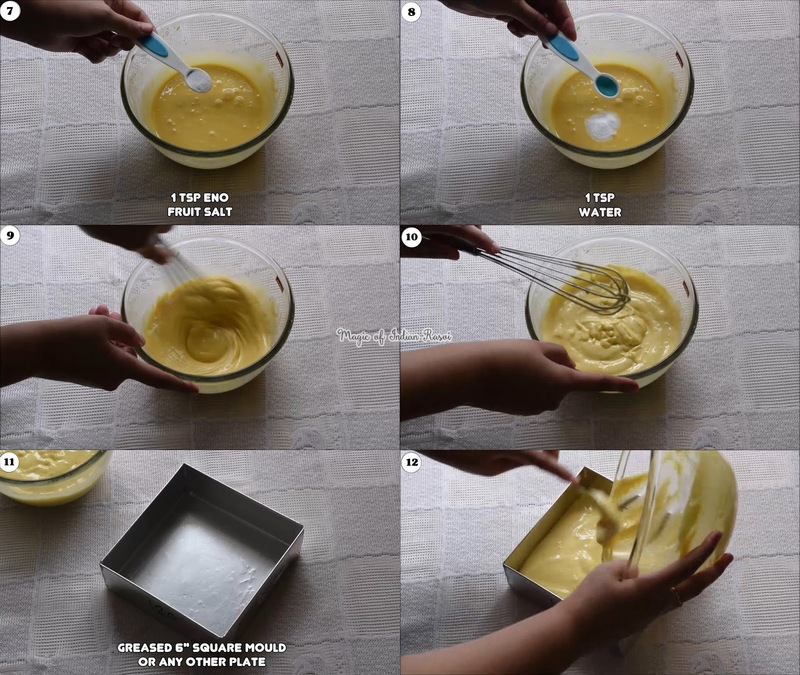 Immediately put the batter in Greased 6" Square mould or any other mould or plate for steaming. Tap the mould lightly to evenly spread the batter. 6. Put the mould in a steamer and steam on high flame for 15-20 min or till done. Ensure that the water is boiling in the steamer before putting the mould. 7. Once done remove the mould from steamer and let is cool down completely. 8. 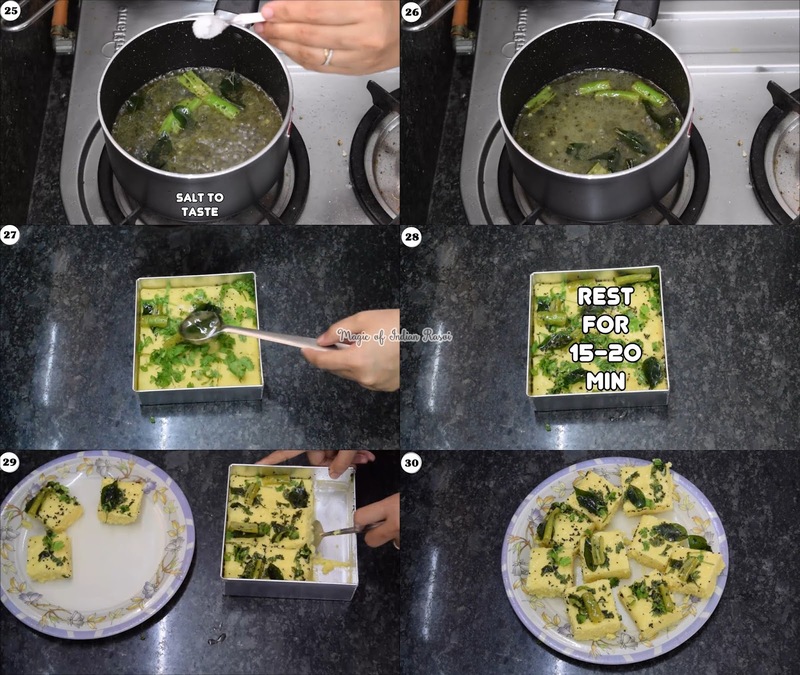 Once the Khaman cools down cut it in to 1" square shape and also separate it from sides of the mould. 9. 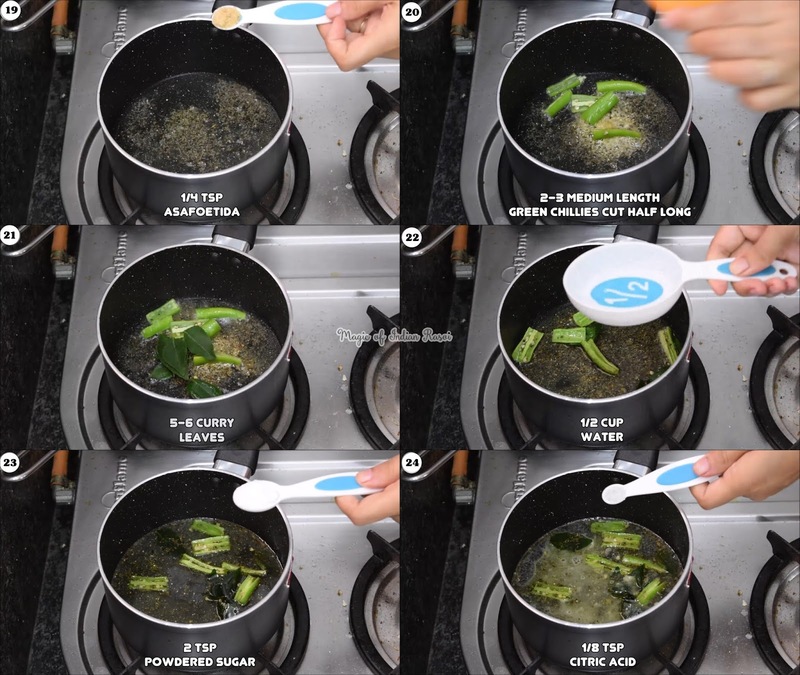 Now take a pan and heat on high 3 Tbsp Oil. 10. Add Mustard Seeds (Rai) and allow it to crackle. 11. 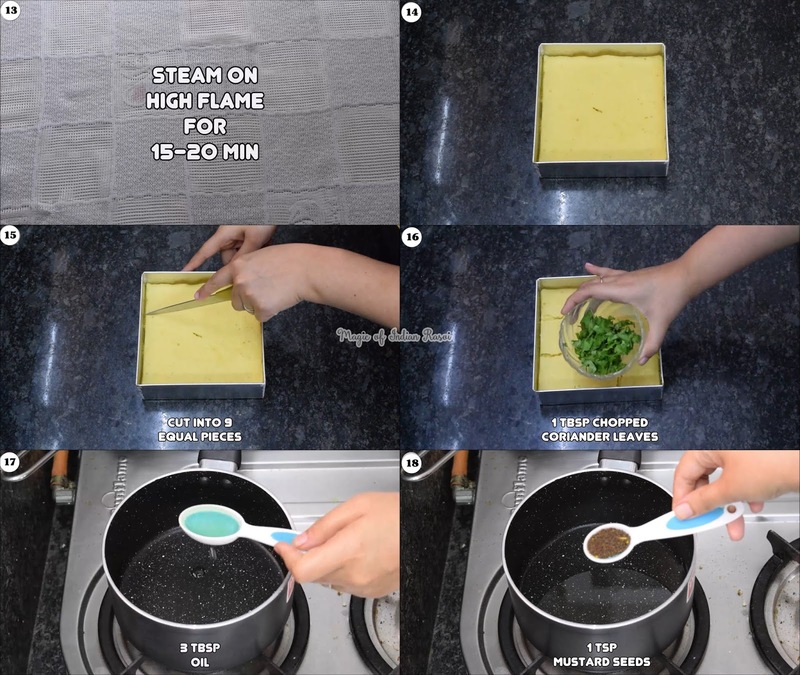 Reduce the flame to low-medium and add Asafoetida (Hing), Cut Green Chillies and Curry Leaves (Kadi Patta) and mix well. 10. Add Water and put the flame on high. Now add Powdered Sugar, Citric Acid (Nimbu Ke Phool) and pinch salt and mix well. 11. Once the tempering starts to boil switch off the flame. 12. Now add Cut Coriander Leaves (Kothmir) on the Khaman and pour the hot tempering on the Khaman evenly. 13. Let the Khaman rest for 15-20 min for the tempering to get absorbed. 14. Remove the Khaman in a plate. Instant Nylon Khaman / Gujarati Rasawala Khaman are ready to serve!